April 11, 2019 – Pascha, the greatest feast of Christ’s Resurrection, falls on April 21, 2019. 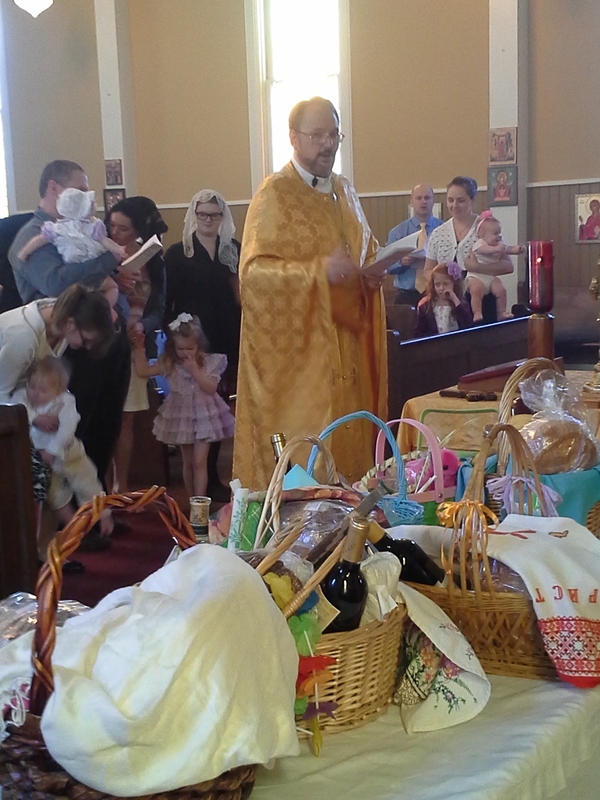 Easter Baskets will be blessed following the 9 AM Procession, Resurrection Matins and Divine Liturgy. They will only be blessed inside the church so bring them prior to the start of the 9 a.m. Divine Services. The blessing of baskets will be close to 11:15 a.m. Around 11:30 a.m. everyone will enjoy a Paschal Luncheon in St. Mary’s Hall with items that we blessed in the church. Holy Week & Easter schedule for 2019. Come celebrate with us. Everyone is welcome! Note: We always make a few extra pascha (paska) breads, potica rolls, kolachy and pirohi. Come early in the week to get the best selection for your Easter celebration. It’s first come, first served. If you wait until Pascha morning you’re likely to be disappointed if we’ve sold out. FYI, we also have pysanky supplies in our hall so you can come make your own decorated Easter eggs. It’s best to call 317-632-4157 before you come to make sure someone is there to help you. Outside of services (check the weekly bulletin) typically we’ll be able to answer inquiries and help you with your baked goods purchases. 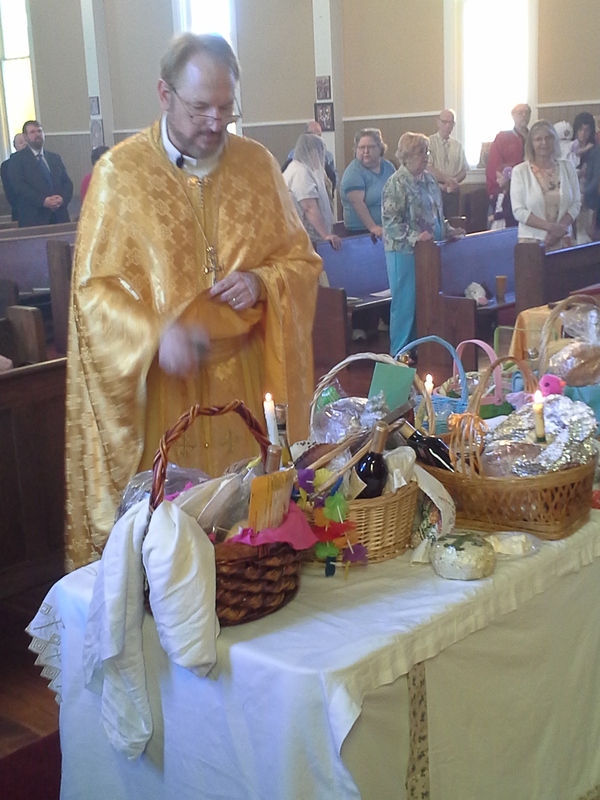 A venerable tradition in the Byzantine Church is the blessing of Easter Baskets. It is a very symbolic and tasty custom. 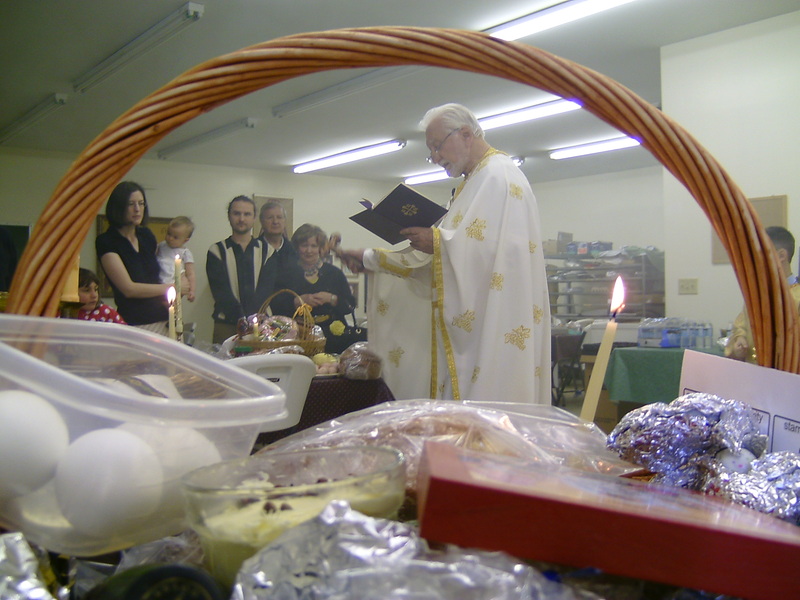 These baskets of food are brought to the church to be blessed after the Resurrection matins Service. The foods represent the foods abstained from during Lent: eggs, meat, butter, rich breads and more. All meals on Easter Sunday are eaten from the basket, so that no one need be busy with preparation of additional food on such a solemn Holy Day. Each basket is covered with a cloth usually embroidered with the words “Christ is Risen” and containing a lighted candle, which is also usually decorated. 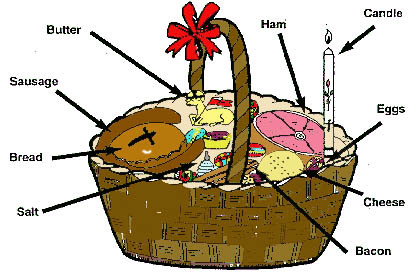 The traditional basket contains the Easter bread called pascha, ham, hrudka or sirets (egg cheese), kolbasi (sausage), butter, pysanki (decorated eggs), chrin (horseradish and beet mixture) , bacon, and salt. The contents of the basket vary from family to family in terms of additional meats, wine, pastries, candy and other treats. Here at St. Athanasius we bake potica (nut rolls) that are a favorite traditional dessert enjoyed by many especially during the Easter and Christmas seasons. 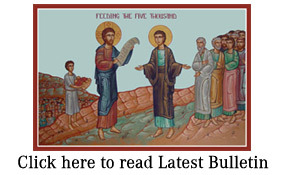 Order your Pascha bread and nut or poppy seed rolls here. 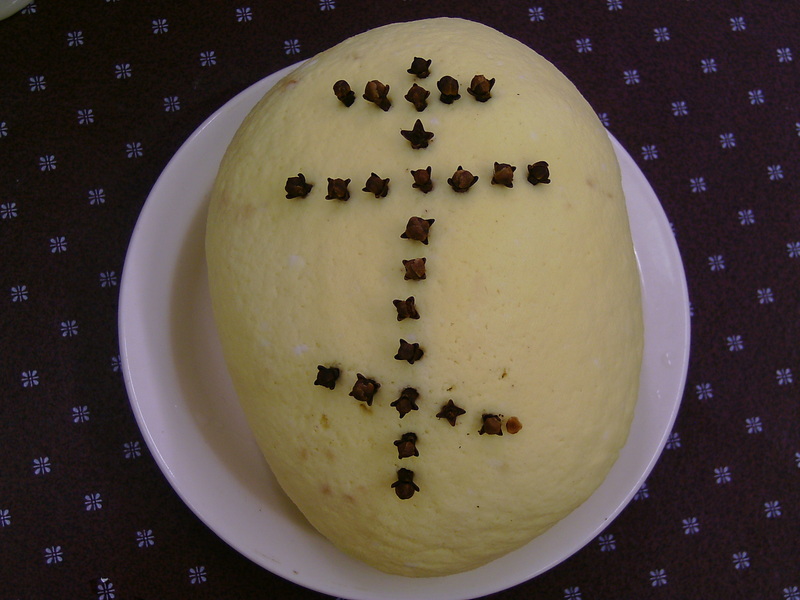 Pascha or Paska: The Easter bread – a sweet, rich egg bread decorated with braids, crosses, or plaits looking like a crown. 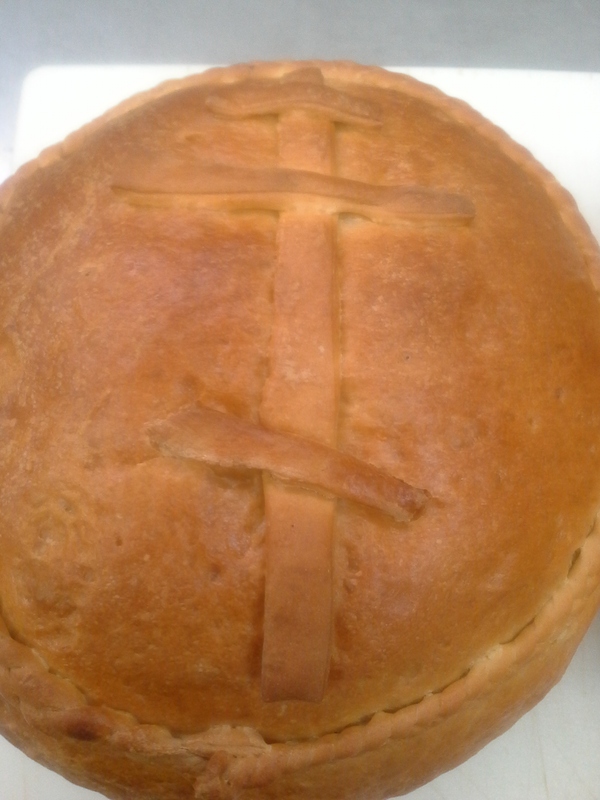 It is usually round and is symbolic of Christ who is our true Bread of Life. Ham: This meat is popular for its richness and symbolic of the great joy and abundance of Easter. Some people may also have lamb or veal. Hrudka or Sirets (egg cheese): This is a custard-type cheese made from eggs and shaped into a ball. It is mild and usually sweet, representing the moderation that Christians should have in all things. Sausages and Kolbasi: These sausages are spicy and garlic seasoned, are usually of pork and indicative of God’s favor and generosity. Butter: This favorite dairy product is often shaped into a lamb or is decorated with a cross. It reminds us of the goodness of Christ that we should have toward all things. Eggs: Hard-boiled eggs are brightly decorated with many symbols, like triple-bar crosses, suns, stars, flowers, birds of water motifs. Elaborately decorated eggs or pysanky have been an artistic expression of the season due to the intricacies of the designs and the number of colors used. An egg dyed a single color (traditionally red dye) is called krashanky. Eggs are symbolic of new life and resurrection. We have a pysanky class the Saturday before Palm Sunday, April 13, 2019. Go to the Facebook Event to get more details. The supplies are also available in St. Mary’s Hall throughout the week so give us a call if you want to come by to use them. Horseradish (Chrin): Horseradish is usually mixed with grated red beets, symbolic of the Passion of Christ, but sweetened with some sugar because of the Resurrection. This bitter-sweet mixture represents the sufferings of Christ. Bacon: A piece of uncooked bacon is cured with spices. It is symbolic of the overabundance of God’s mercy to us. Salt: This condiment enhances flavor reminding the Christian of his duty to others. The articles are placed in a WICKER basket, and a ribbon or bow is tied to the handle. 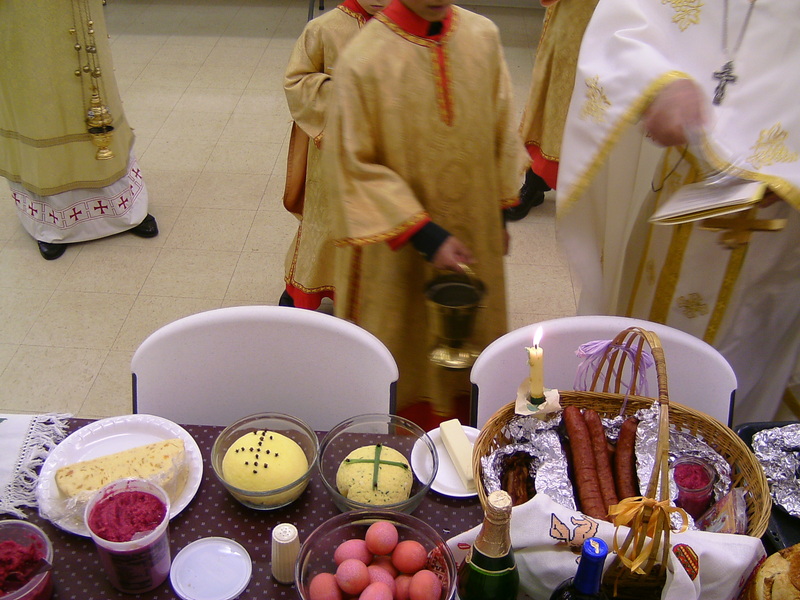 A DECORATED CANDLE is placed in the basket and lit at the time of blessing. A LINEN COVER, normally quite intricately embroidered with various Resurrection themes and symbols of Christ, or simply an intricate multi-colored border and the words “CHRISTOS VOSKRES” OR “CHRIST IS RISEN” (depending which language is more appealing to you) is placed over the food when it is brought to the church. It is customary to break one’s Easter Fast with foods blessed at this time and only then proceeding to the foods now ready on groaning tables; foods which have been in process of preparation for the past three days. 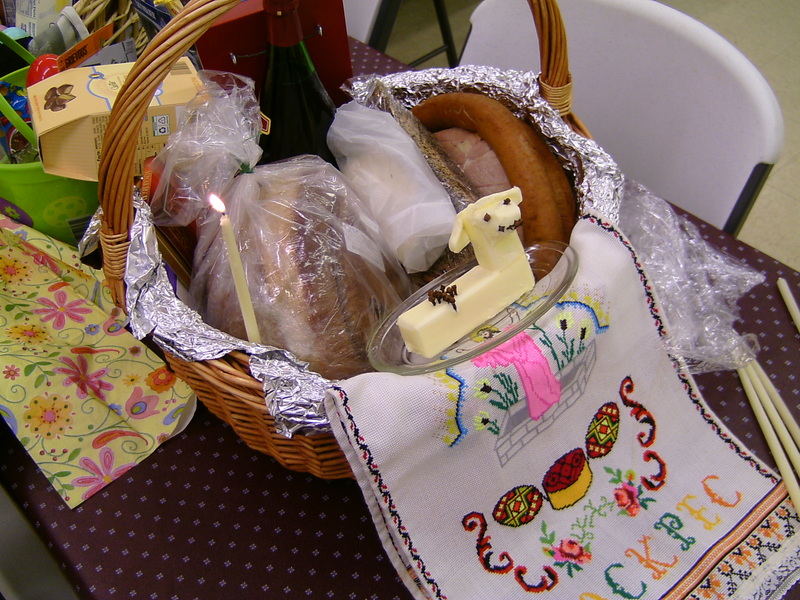 For recipes see Carpatho-Rusyn Easter Foods or this PDF: How to Prepare an Easter Basket. Combine all ingredients in either an enamel pan for the stove top or a microwavable bowl. On the stove top cook over medium heat, stirring constantly until the mixture curdles. (If using a microwave, cook on high for 2-4 minutes, take out & stir with a wire whisk. Repeat cooking 2-4 minutes & stirring many times until the mixture curdles.) Using a flour sack cloth-lined colander drain the whey. (You can use multiple layers of cheese cloth but flour sack cloth [Sam’s Club, Target, Bed Bath & Beyond sells them], a pillow case or a old clean T-shirt works better.) Once it stops dripping wait a few minutes until the hot mixture cools a little. Take the cloth & contents and twist the top to form a ball – the tighter the better. Caution: this may still be hot to the touch – be careful. Secure the top of the cheese in the cloth with twine. Hang the ball over the sink or a container to capture any remaining whey. Once cooled gently remove the hdruka from the cloth, place in a glass bowl or wrap in plastic then refrigerate. 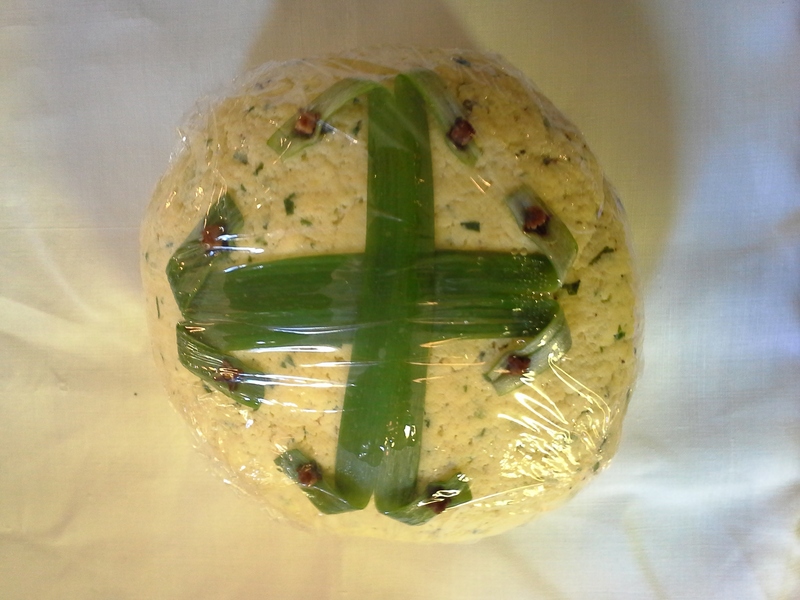 Before placing the cooled Easter cheese in your basket to take to church, decorate it with a cross made from garlic plant greens secured at the ends with whole cloves. By the way, drink the whey for a great savory protein drink. Yumm! For those of you who can not be here, may St. Athanasius parish extend our sincerest wishes for a joyous and a blessed Easter, an Easter which brings nothing but an abundance of all good things from the hand of a merciful and a generous God to you and to all your loved ones. Christ is Risen! – – – Indeed He is Risen! Christos Voskrese! ——- Voistinu Voskrese!